This article is about the Mexican islands. For the Falkland island known as Isla María, see Bleaker Island. For the Czech card game known as Mariáš which is similar to a German game, see Sixty-Six (card game). The Islas Marías ("Mary Islands") are an archipelago of four islands that belong to Mexico. They are located in the Pacific Ocean, some 100 km (62 mi) off the coast of the state of Nayarit and about 370 km (230 mi) southeast of the tip of Baja California. They are part of the municipality (municipio) of San Blas, Nayarit. As of 2011[update], the islands were used as a penal colony until February 18th of 2019 when Andres Manuel Lopez Obrador (then Mexico's President) ordered the closure of its operation as Islas Marías Federal Prison. The first European to discover the islands was Diego Hurtado de Mendoza, a cousin of Hernán Cortés in 1532, who gave them the name Islas Magdalenas. He found no evidence of prior habitation by the Native Americans. The islands have an aggregate area of 244.97 km². 1,116 people lived on Isla María Madre as of the census of 2005 along with around 8000 prisoners. The other islands are uninhabited. The main settlement is Puerto Balleto, with a population of 602. 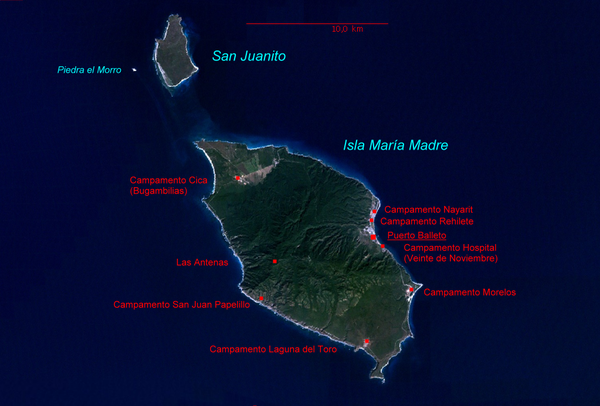 Isla María Madre is the largest of the islands, with a surface area of 145.28 km². It houses the Islas Marías Federal Prison which was established there in 1905. 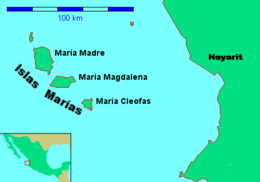 The next two largest islands are Isla María Magdalena (70.44 km²) and, further south, Isla María Cleofas (19.82 km²). They were named after three women called Mary in the Biblical New Testament: respectively, Mary, the mother of Jesus, Mary Magdalene, and Mary, the wife of Cleopas, and are referred to as the Tres Marias. A smaller island, San Juanito, with an area of 9.1 km² lies off the north coast of Isla María Madre. Research supports the hypothesis that the Islas Marias are fragments of continental crust left over from the separation of the Baja California Peninsula from the mainland of Mexico. Rocks found on the islands correspond with rocks found around Cabo San Lucas as well as Puerto Vallarta. In addition to prisoners, on Maria Madre island there are employees of diverse institutions of the federal government, such as the Secretariat of Public Education, the Secretariat of the Environment, the Secretariat of Communications and Transport, post office, and the Secretariat of the Navy. Another group of settlers is made up of religious ministers and acolytes of the Catholic Church, nuns of the Order of Social Service, and invited teachers, technicians and their relatives. The colony is governed by a state official who is both the governor of the islands and chief judge. The military command is independent and is exercised by an officer of the Mexican Navy. The mean temperature of island remain between 84 and 89 degrees Fahrenheit throughout the year. In April, May, and June sometimes temperatures cross the limit of thirty five degree Celsius. In December January, and February the temperatures remain under twenty five degrees. Sometimes the temperature may drop under twenty degree Celsius. Most of the time weather remains dry but July, August, and September may receive rain up to 10mm. The average wind speed is between twelve and nineteen km/hour. The below chart shows the maximum and minimum temperature. Hurricane Willa passed through the Islas Marias on October 23, 2018. The National Hurricane Center reported at 9 AM MDT "Aircraft finds the core of Willa passing over Las Islas Marias Mexico". A subsequent report from the NHC stated that "Life-threatening storm surge is occurring along the coasts of the Isla Marias'. The NHC also reported that "An automated observing site on Las Islas Marias recently reported a sustained wind of 88 mph (142 km/h) with a gust to 112mph (180 km/h)". The lighthouse was constructed by the Govt. of Mexico and is named San Bias lighthouse. The height of tower is two hundred feet or sixty two meters. The lighthouse main gallery is painted white while the tower of the lighthouse is colored in red and white. The lighthouse is made of concrete and a large single story keeper house is also constructed with lighthouse. The light house shines two white flashes every ten seconds. The diameter of the light house is 7 meters. The Islas Marías Federal Prison was constructed in 1905. One of its more notable prisoners was the Mexican progressive writer Jose Revueltas who wrote his first book Los Muros de Agua (The Walls of Water, publ.1941) while incarcerated there. Mexico's newly-elected president Andres Manuel Lopez Obrador announced on February 18, 2019 that his administration will close the Islas Marías Federal Prison, replacing it with a new cultural center that will be named for Jose Revueltas. ^ "Marías Islands | archipelago, Mexico". Encyclopedia Britannica. Retrieved 2018-08-07. ^ "UAE Tours - Isla Maria Madre Islands, Temperature and other details". www.vjcyber.com. Retrieved 2018-08-07. ^ "Designation of New Biosphere Reserves". UNESCO. 17 June 2010. Retrieved 13 June 2016. ^ "Islas María". UNESCO. Retrieved 13 June 2016. ^ "Climate Puerto Balleto (Isla María Madre)". meteoblue. Retrieved 2018-08-07. ^ "Lighthouses of Mexico: Northwest Coast". www.ibiblio.org. Retrieved 2018-08-07. Wikimedia Commons has media related to Maria Islands.